Does my son or daughter really need a recruiting service to get recruited - probably not. Most likely, all they really need to do is run fast or jump high or throw really far. If they do not hit a particular mark then all they probably have to do is to initiate contact with enough college coaches to garner some interest. In fact, during the span of my 25 year coaching career at the NCAA I level, I was shocked by the price tag of such recruiting services when compared to the end result. Most recruiting services hire staff members with little expertise and actual experience in the sport they are representing. So, as a result the end product is typically little more than some generic finger-pointing in the right direction and a fancy online profile for college coaches to peruse, if so desired. On the surface, the recruiting process seems simple enough. In fact, on the surface running or throwing or jumping seems simple enough, very simple. In fact, our species has been doing it for years. Seemingly all one needs to do is buy Jack Daniel’s Running Formula and voila - you are on the road to greatness. How hard is it, right? Do a little research and workout. Anyone can do it. However, to run faster or faster longer or to jump or throw further or to vault higher, one would certainly benefit from a knowledgeable coach. Does my son or daughter really need a coach to run fast? No, not if they are naturally fast. But, they do need a knowledgeable coach to run faster. That is what we do. Are we needed – probably not? Many, many high school student-athletes are recruited annually without using a recruiting service – just as many, many 100m runners run fast without adequate preparation or training. However, if you want to run faster…if you want to get into a school one rung higher than you initially anticipated, if you want to get more scholarship money than you thought possible, and if you want to be exposed to programs and colleges that would be great fits for you based on real information gathered through the collection of data, years of coaching experience and knowledge of over a time thirty year period of time that is where we come in. We can help you maximize financial aid packaging. We can help you identify schools and programs not currently on your radar. We can provide program information with regard to attrition rates, injuries, program burn-out, coaching changes, facility limitations and such. And, from a cost analysis is it worth it? Though the total cost can appear daunting at first the cost of a recruiting service pales in comparison to future educational costs. Most of you will be paying somewhere between $100,000 - $700,000 – recruiting service costs will range from 0.002 – 0.9% of that amount and will be almost certainly be absorbed by added financial aid or scholarship dollars. Are we needed, no. Will we make your experience better, YES! Will you end up with more and better choices and more lucrative offers, YES! Carefully proofread every email before hitting send. I cannot tell you how many emails I received from recruits specifically addressed to a rival coach expressing their interest in that rival school. A great deal of communication in the early phases of the recruiting process is going to be cut and paste on both sides, however, making a simple mistake can dehumanize the process and render the remainder of your communication less credible. It may also be helpful to send a couple of test emails to yourself first to ensure that the font or text sizes have not changed where you have cut and pasted new names. Want to know what you need to run, jump or throw to get the attention of the schools of your dreams? I have provided links to numerous schools below. Most indicate what performance they require from you to either walk-on or gain an athletic scholarship. I would caution you to take this information with a gigantic grain of salt. Many program’s list of published standards is more their dream wish list as opposed to their actual line in the sand list. 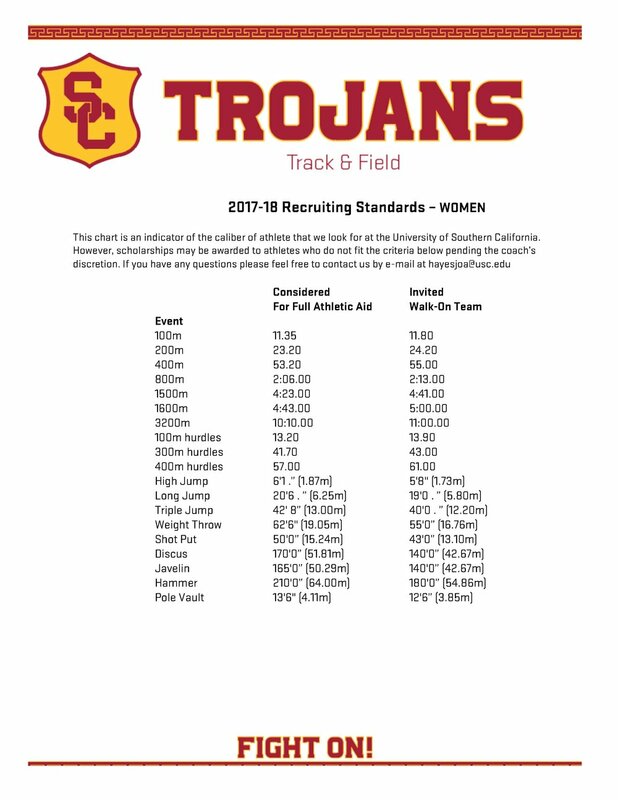 Numerous programs list rather stringent walk-on standards, but a simply quick perusal of their teams performances at www.tfrrs.org will clearly show that many athletes in their program (regardless of year in college) are incapable of hitting the listed walk-on standard expected of high school athletes. My point – don’t be discouraged if you don’t hit their published marks – just keep improving and striving toward that mark. Use the recruiting process to sell yourself effectively! However, if you are not anywhere near their walk-on times, you may want to consider other options.